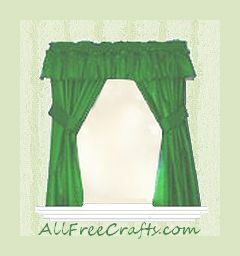 Making a quick set of curtains and a valance is something that you can do even if you don’t have much sewing experience. It’s just a matter of thinking through the process and calculating for fabric needed and knowing how to use a sewing machine. Decide what fabric pattern or color will work best with your room decor. Going to the fabric store is always one of my most fun times, I keep my imagination open and get swatches of fabrics (and prices) the first time to see what all my options are. Take swatches home and start eliminating them by laying them next to major parts of the already decorated room (couch, chair, tables, walls, etc). Once you’ve decided on your fabric start measuring. To measure for material, decide how long you would like the valance to be. Where will you place the curtains in the window? Will you do them cafe style or halfway down the window? Maybe you only want a small space between the valance and curtain, use your imagination, draw a sketch of the window and do some placements on it to see what looks good. Once you make these decisions, measure from your top reference point (top of window, top of rod) down to where you want the valance to end. Add additional 7″ for top and bottom hems (this will give you 3″ for top hem, which rod will go through and 4″ for bottom hem). Let’s say you want your valance to be 10″ long, add 7″ for hem and you have 17″. Now measure for your bottom curtains. The same goes here, measure from top reference point (where your curtains will start) to just BELOW or ABOVE the windowsill. Add the 7″ to this length. EXAMPLE: 32″ bottom curtain length, add 7″ = 39″. Write all this down. For width across, measure across window from outside to outside molding. Depending on how “full” you want the curtains, will be the deciding factor on how much material you purchase. Normal fullness recommendation would be twice the window width, or at least ½ again as much. We are going to be very basic, let’s say a normal window is 36″ across X 60″ length. This means you will need to calculate double the width for the valance and curtains, but remember the curtains are split in the middle. Most material will run 36″ – 44″ (regular material) to 60″ (drapery & upholstery material) in width. If you choose a fabric width of 36″ – 44″, it will be easier to just use the width doubled. If it’s wider cut a little off the ends if needed. Now it’s time to go get your material! Take your swatch, sketch and measurements with you! I would recommend a pliable fabric that is easy to work with (cotton, broadcloth, etc). Have your material store sales person help you with calculating the amount, and give you any details in laying out, especially if it has a design going a specific way or has a nap. In most cases, 3-3½ yards should be plenty per window. If you do not pre-wash material and wash the curtains later expecting them to be the same length, you may be surprised! If you have pre-washed your material, take it out of dryer, fold in half, wrong side out (if you can tell), like it was previously from store off the bolt, and lay it on your surface and smooth it out (table, floor, etc.). Do the same for all widths of material; this will make it easier to handle. You may want to touch up with an iron. Time to mark the fabric and cut! Your material is now laid out (not many wrinkles). You’ll want to get an even line across the top using your yardstick. Mark a straight line with a pencil along the top (if darker material a pen will work or even chalk if you have it). Eyeball it to make sure it looks even, sometimes the fabric store will not cut it even so it’s up to you. This will be your starting reference point (this will be a cutting line for you). Get your calculations for the length for each: valance and curtain. Now measure from that straight line down for valance length needed, do this twice because it needs to be doubled for fullness (unless 60″ width fabric). Make a mark. Do the same halfway across and on the folded edge. Now put your yardstick across from mark to mark and draw a line (this will also be a cutting line). Do the same for curtains. Each curtain side gets its own length (unless 60″ width fabric). Grab a couple of pins and pin just inside the edges and lines of each section you marked. Cut along lines. You should have 4 pieces cut, 2 for the valance and 2 for each curtain side. Once again were going to mark, this time on the right side of fabric. Open up your pieces, right side of fabric up, lay them out straight, using a pencil, lightly mark 3″ down from straight top on each piece, make several marks across. Use yardstick to connect marks to make a straight line. Do the same on the bottom, 4″ up from straight edge. Mark 1″ in on both side edges of each piece. Mark all pieces. Make sure all marks are lightly placed on outside of fabric, but dark enough so you can see them. Sew two valance pieces together, so it’s one long piece. Press seam flat. Fold under side edges of all pieces turning under ½” twice (will be 1″ all together, pencil line should be on outside edges), press & stitch along inside folded under edge. Press up hems to inside of material along all marked lines. Fold them under ½ of width and press again. Stitch along that folded edge on inside. Holding fabric as you stitch to make sure fabric doesn’t bunch up. You should have a 2″ bottom hem for each piece and a 1½” hem for top hem to slide curtain rods through. Make sure to backstitch when you begin sewing and at the end to reinforce stitching from coming out. Voila, there you have it! This process should only take about 1½ hours. Put your rods through the top hems of curtains. Put up valance and curtains. Robin Hall has been a successful Tailor by trade in the Midwest with over 30 years in business.